1.ACTUAL BRIGHT LIGHT â 6 Wattshigh light. 6500K is a natural white color ensuring clear lighting without being harsh. 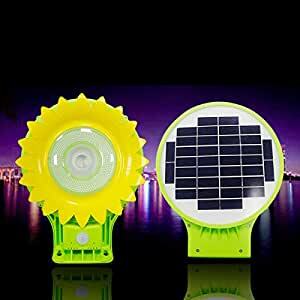 Lights up your garden, driveway, patio, entrance, street or anywhere you need light after dark. 2.WALK BY, LIGHTS ON – With Sensitive PIR motion sensor, MOREFINE outdoor light keeps low light mode all night if no object is detected at night;Once any object approaches within 5-8 meters, MOREFINE solar powered light will automatically turn into high light mode , then turn back to low light mode unless the object is detected again. 3.LONG LIFE BATTERY & BETTER SOLAR PANEL – Premium 44000mah 7.4Volt battery has the power to stay on longer and run for years and years. The solar panel is a premium 9 Volt and 6 Watt Polycrystalline panel. Ensuring a full charge in about 8 hours. 4.CHOICE OF INSTALLATION & EASY INSTALLATIONâ Easily install the light anywhere in minutes, no need to hire an electrician. Mounting hardware included. Direct mount onto wall or pole. 5.QUALITY AND WARRANTY â High quality aluminum design has an IP65 Waterproof rating. OOGLV LED Solar Street Light with Motionâ Available to use as a Solar Pole Light or Solar Wall Light mounting. Housing Materials: Plastic and Aluminum housing.
. IP Rating: IP65 Outdoor Rated. ZOOGLV is a professional LED lighting manufacturer dedicated to high quality LED products and other security solutions.